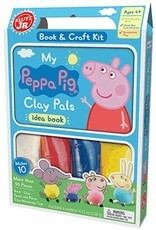 Klutz Jr My Peppa Pig Clay Pals - Grow Children's Boutique Ltd.
Little fans of the hit Nick Jr. show, Peppa Pig, will love creating their favorite characters with this book and craft kit! Perfect for building fine motor skills, this kit includes everything a little maker needs to create Peppa's pals like Danny Dog, Rebecca Rabbit and Suzy Sheep. With 4 colors of air-dry clay, colorful character punch-outs, a clay measuring tool, and a color mixing guide, kids will have their very own Peppa jumping in muddy puddles in no time.